Businesses are often questioning whether they should choose offline marketing or online marketing. It's an incredibly personal decision based on a few factors like marketing budget, target audience and time. Software is available for online marketers to make it easier for companies to create their own campaigns, but offline marketing requires printing presses for print media and actors and producers for commercials. With more customers using social media, a small business can reach a larger audience with less of a marketing budget to spend. Online marketing is advertising that takes place on blogs, videos, social media sites and online classifieds. A small company doesn't have to spend thousands of dollars to place their ads on various websites. The advertisements are not instantaneous, but they don't take as long to implement as traditional marketing campaigns. It can be used for both brick and mortar as well as purely Internet-based businesses. This type of marketing helps to attract a target audience for a blog or website by creating content that the reader will find valuable. When a reader finds the content valuable, they will be more likely to visit the site and turn into a paying customer. Whether it's a blog or website, small business owners need views and visitors. Social media marketing targets social media sites to gain traffic to the business owner's website. The content should be interesting, funny and shareable. The business owner wants a topic that will encourage people to share with friends and family. Every small business should have a website or blog. The traffic that is garnered through social media or content marketing should be directed to the business' online presence, which is the website. An informative blog will provide information and value for readers. When a small business provides value, a customer is willing to repay that with trust. They are more likely to buy the business' products and services. Offline marketing is considered traditional marketing. It's found on television, radio, billboards and in newspapers. Companies will come up with an advertisement and buy space or airtime for their commercials and ads. It's usually costly and takes months of planning and implementation. Newspaper display advertising is display ads that are used to promote the products and services of medium to large businesses. A large advertisement can be costly, but there are varied sizes that can meet the budgeting needs of mid-sized businesses. If you can create a buzz for your product or service, friends and family will tell others about the company and its offerings. The best advertisement you can get is from a happy customer who is ecstatic about the product or service. When you exchange gifts with other businesses, the item provides value to the corporation as well as putting your company name out there in advertising. It could be an umbrella with the company name and address on it to pens or travel mugs. When the gift provides value, according to Promo Gallery website, it will be used more often and others will see your company name. The choice of whether to use traditional or offline marketing and online marketing depends on many factors including how much of a marketing budget you have. Many small businesses do not have a large marketing budget, so they must make every dollar count. Businesses with limited cash might consider a certain percentage of offline marketing versus online marketing with online marketing being higher. The targeted audience is a huge factor in where the most money should be spent. Consider the audience's wants and needs before locking your marketing budget into a choice. 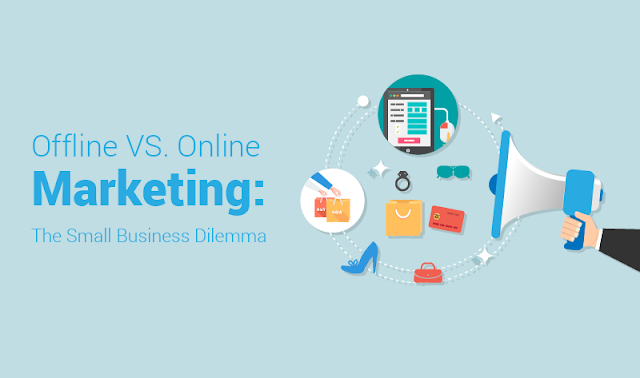 There's a delicate balance to maintain when choosing either offline or online marketing. Online marketing requires constant maintenance but allows the business to keep on top of current results. This can allow the company to make instant changes if something goes horribly wrong.